Spiral Tide Pottery is for the lifelong beachcomber. It’s for the person who brings shells and pretty rocks home to remember a special beach vacation when they live far away from the coast. It’s for that person you know who lives in and on the sea, who strives to find the perfect shells and the perfect ‘Beach Hair’. Spiral Tide Pottery is for you too, as a treat to yourself and an inspiration to slow down and take time for you… time to drink that cuppa while it’s hot and remember you are worth each and every minute it takes to finish your tea. 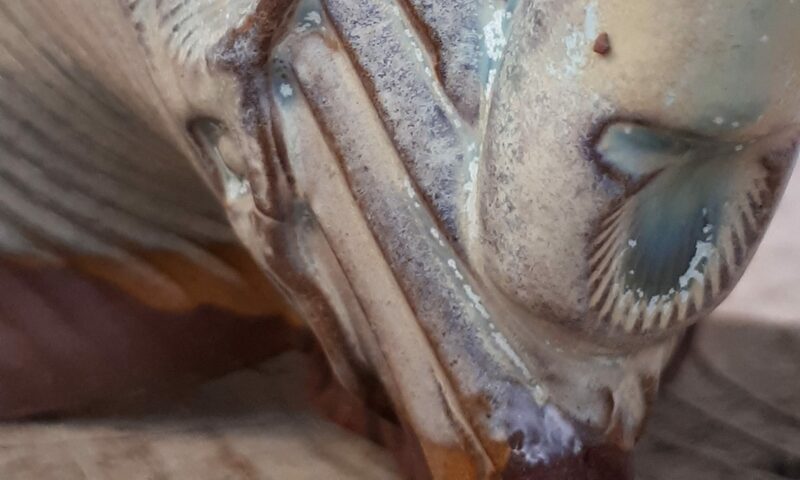 All Spiral Tide Pottery work is hand constructed out of soft slabs of red, earthenware clay. Building pots by hand requires me to slow down, to examine every angle, curve, foot and rim; nothing is taken for granted, every element of every piece is a considered choice. That consideration creates pottery that calls out to be held and offers a place for mindful moments of self-care. Through form, surface treatment & glazing, every piece of Spiral Tide Pottery reflects the qualities of the sea that have captivated me since childhood. 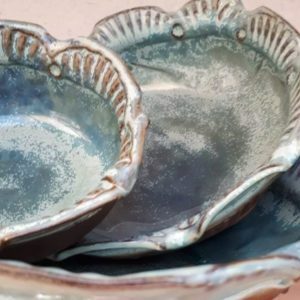 The glaze I mix is reminiscent of the movement of waves crashing on the surf; textures in the clay (created by using shells and handmade tools) offer breakpoints and pooling areas for the glaze to work it’s magic on the eye. Each mug, vase, bowl or serving dish I make brings the ocean into your hands. I am a lifelong beachcomber. As a child I would arrange my beach treasures around my bedroom to bring the ocean home. When I was 10, my mother surprised me with a pottery class for my birthday. That first pottery experience was in 1987 and I’ve had clay under my fingernails ever since. I’ve been a student, a teacher and a maker in various ways over the years; always bringing the ocean home within the surface of my pots. When I moved to Scotland without my wheel in 2009 I started a love affair with hand building that will last for the rest of my days. The process of rolling and texturing a slab of clay is meditative for me, turning that soft slab on it’s edge and building with it is endlessly challenging, fascinating and thrilling all at once. I graduated with a BFA in Ceramics in 2000 and have built my clay practice around full-time jobs; creating studio spaces in corners of spare rooms, basements, and attics just to be able to keep my hands in clay. I have my own studio now in the backyard and feel blessed to be able to say that I have a daily studio practice that challenges and excites me. It is my goal to bring that energy into my pots and, of course, to always bring the ocean home.